Converting old drum brake systems to updated disc brake systems is becoming more and more popular. There are several reasons for these conversions but the most prominent being that a disc brake system is just more efficient. Other reasons include ease of maintenance and the longevity of the system. There are three main components of the system. The first thing to decide when making the switch would be the type of actuator that best fits the application. There are two options for the actuator. First being the standard Surge activated hydraulic actuator. Second being an Electric activated hydraulic pump called an Electric over Hydraulic (EOH) actuator. The standard surge brake actuator is more applicable to single or tandem axle trailers rated at or below 7,000 lbs. While the EOH actuator is better suited for greater then 7,000 lbs applications. 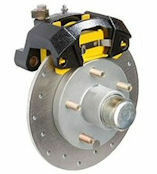 The Second major thing to consider would be the brand/version of trailer disc brakes that you want to install. We have many different options available to fit different types of trailers. The two most popular brakes we have for Boat Trailers are Kodiak (Dacromet/Stainless) and the Tie Down Engineering ‘G5’. More popular brakes for an RV conversion would me the Kodiak (Dacromet) and the Tie Down Engineering Eliminator/Vented brakes. The third and final component of the conversion would be the Brake Line Kit. The brake lines do not need to be replaced 100% of the time but with all the money being invested into a new system it is worth it to upgrade your lines. The most popular Brake line kits for both surge and EOH is the Tie Down Flexible brake lines. The flex lines are DOT approved for up to 3000 psi. and are the easiest to install. We also have a large assortment of AG coated steel and stainless steel line kits.